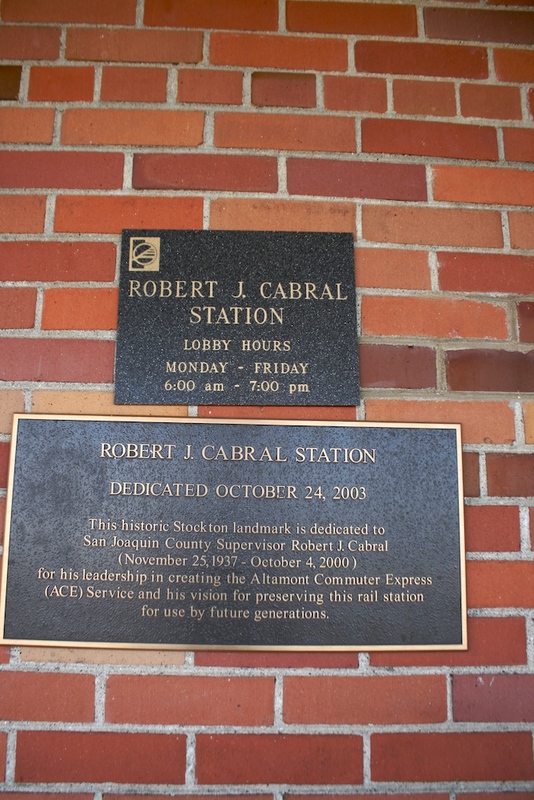 The Stockton/Downtown, Robert J. Cabral Station is the former SP Station and the northern terminus of ACE, the Altamont Commuter Express, this commuter rail line makes three peak direction round trips south to San Jose via Pleasanton (BART connection) over the Altamont pass using Bombardier BiLevel Cars. 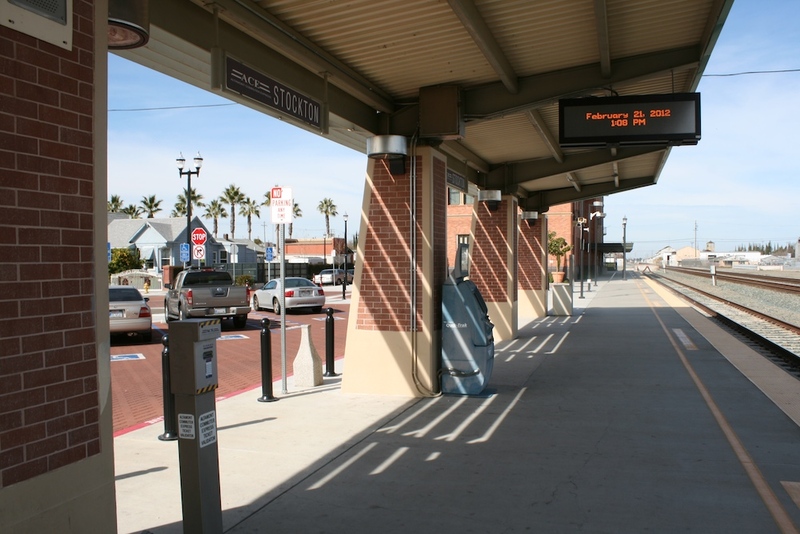 The station also receives service from the two daily roundtrip Bakersfield to Sacramento San Joaquin Amtrak trains that stop at the station and all include bus connections to and from the main staffed Amtrak Stockton/San Joaquin Station 1.2 miles away Passengers arriving on the 4 daily northbound trains at the San Joaquin Station can also request a shuttle to the Downtown station but no shuttles connect to the southbound trains. 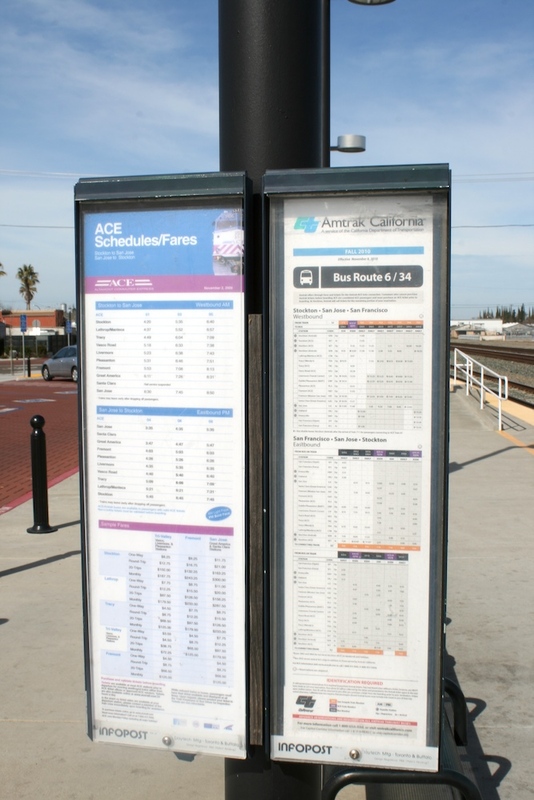 Service at the station stopped existing at the creation of the Amtrak and was first reinstated by ACE when it began in October 1998. 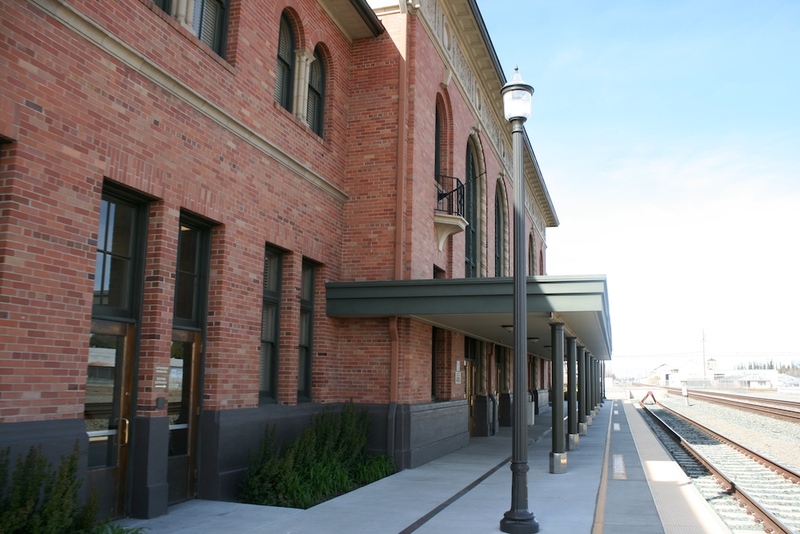 Amtrak arrived next in February 1999 when the first of the now two San Joaquin trips to Sacramento began (Source). 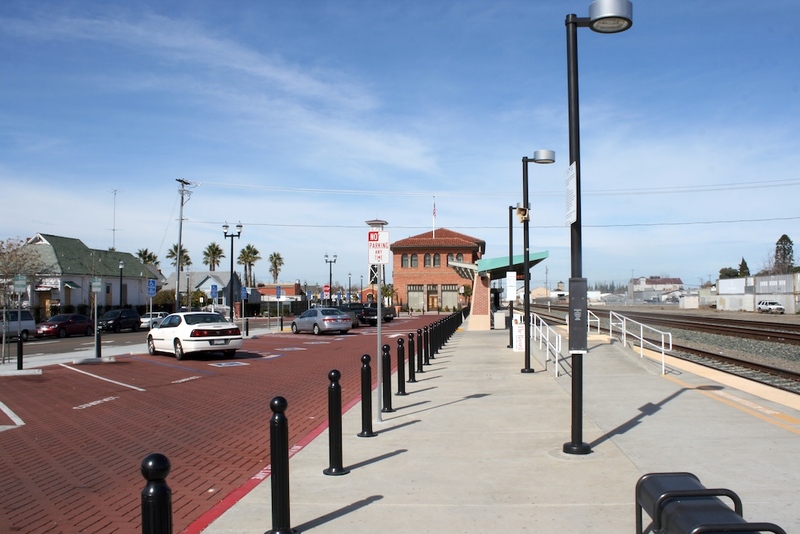 The trains though have to stop on separate tracks, with ACE train pulling into the one real stub end platform and Amtrak trains making a stop just in the middle of the street in the middle of Weber Avenue's grade crossing! 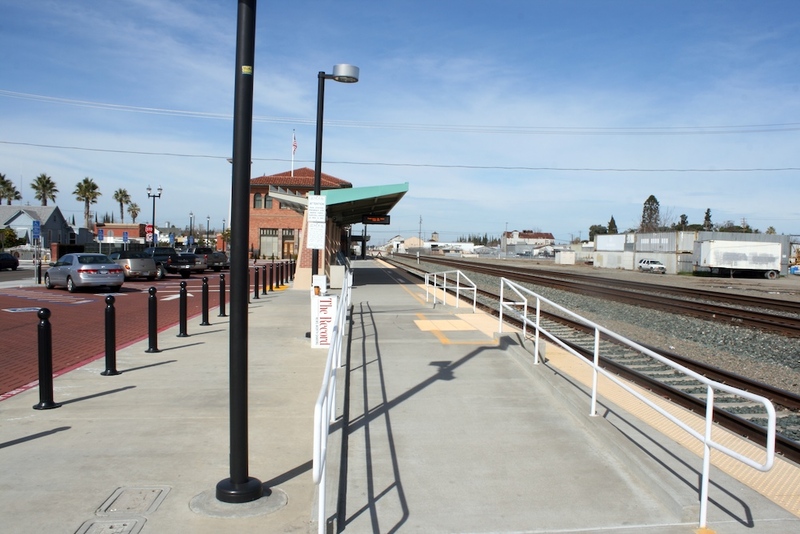 It's the one stop on the San Joaquin where just one and a half cars can open their doors. 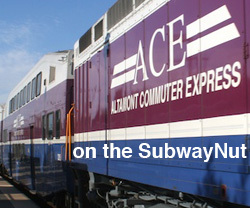 The tour begins at the northern end of the station, at the bumper block of the ACE's platform siding, just south of Miner Avenue crossing beneath the two tracks that continue north. 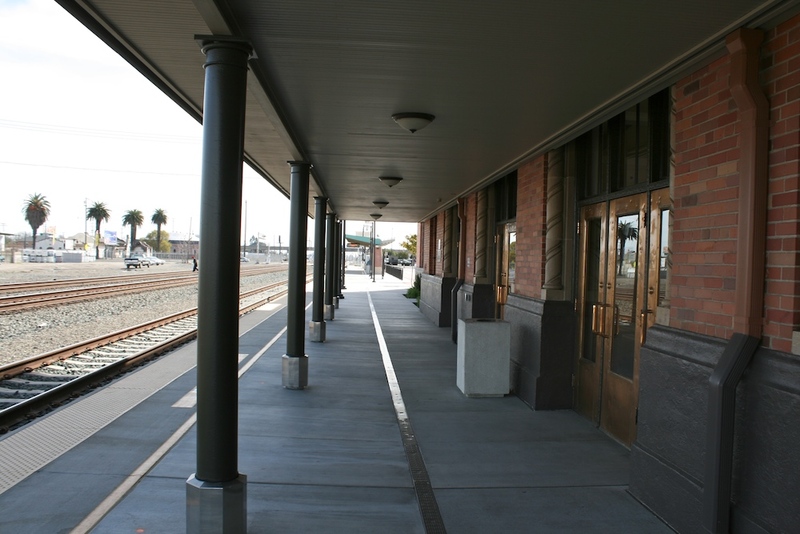 Just set back from the platform, with a replica canopy over the platform at this northern corner of the station doors lead into the historic two-story brick Southern Pacific depot; which opened in 1930 and was restored in 2003. 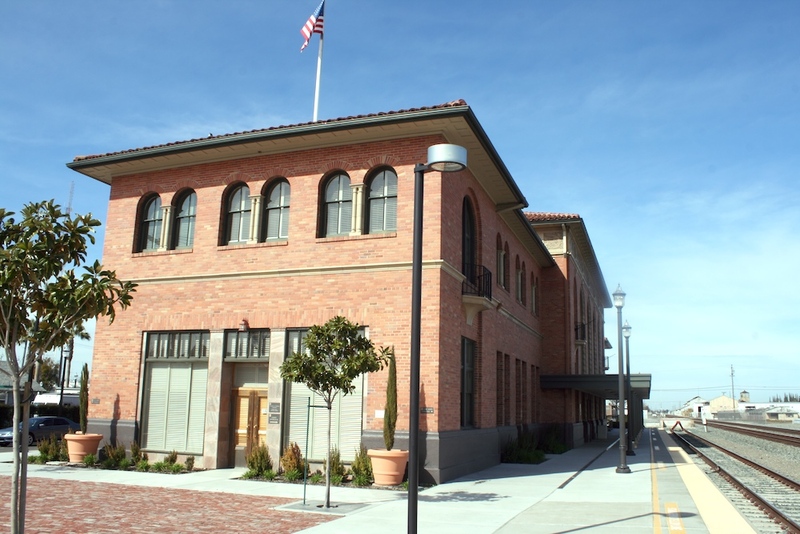 Today it is open from 6:00am to 7:00pm weekdays and houses the headquarters of the San Joaquin Regional Rail Commission, the operator of ACE, on the upper story and a public waiting room and ticket window for ACE (Not Amtrak, there is a sign) in the wonderfully restored lobby. This room has high ceilings and some gold trim on the molding. 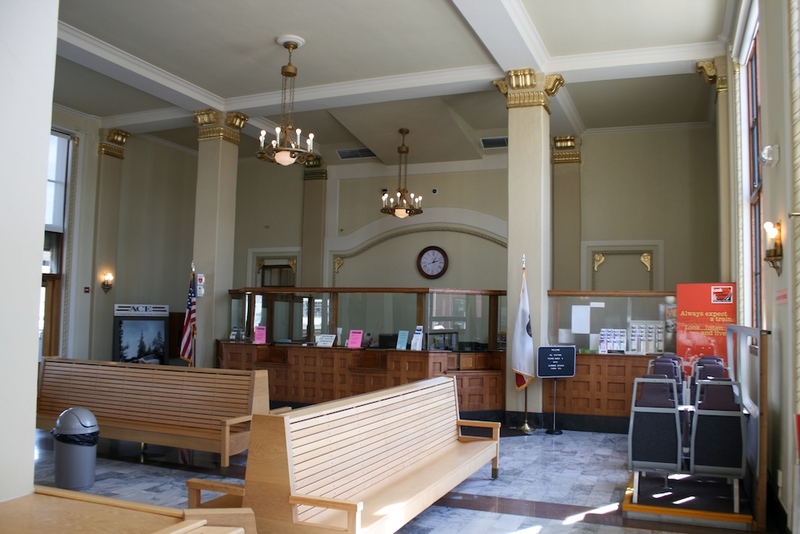 Inside are quite a few wooden benches for waiting passengers and the aforementioned ticket counter with a wooden desk and Plexiglas since ACE runs on the POP system but doesn't use TVMs just ticket agents for its four daily trips, there are validate machines for all tickets. There is also a mock up of four rows of purple ACE seats I guess to show perspective riders what seating is like. 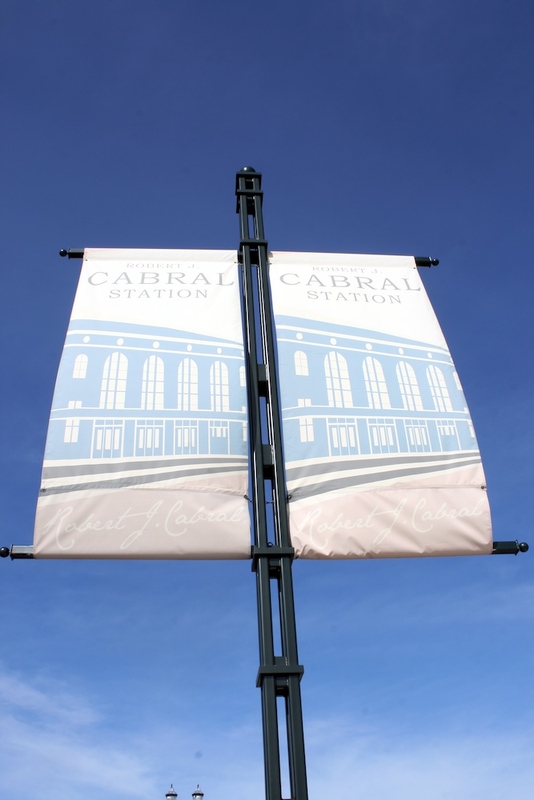 Street side doors of the depot lead out beneath an awning with modern lettering for the name Robert J. Cabral Station and Southern Pacific Lines is etched in the top of the facade just beneath the ceramic mission roof. 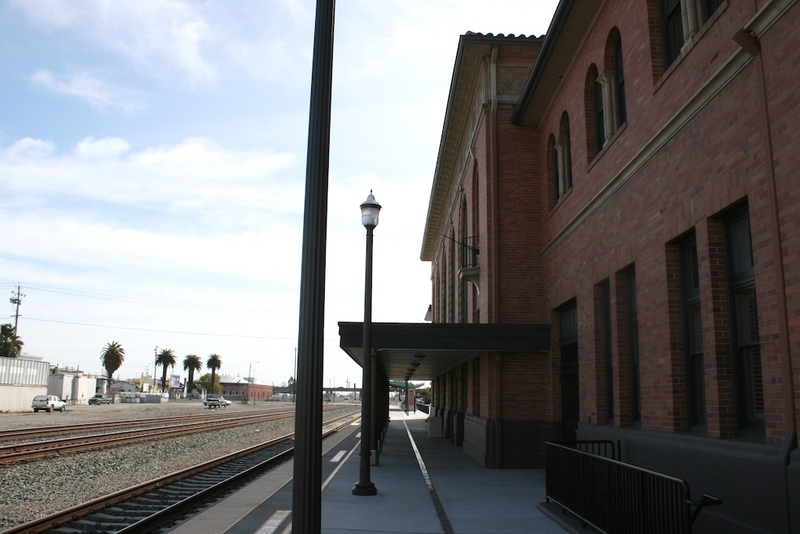 Behind the depot away from the platform are two more buildings, one is nondescript and houses the security office and other is a small modern replica clock tower (that compliments, does not tower over the historic depot) that also has a fountain to one side. 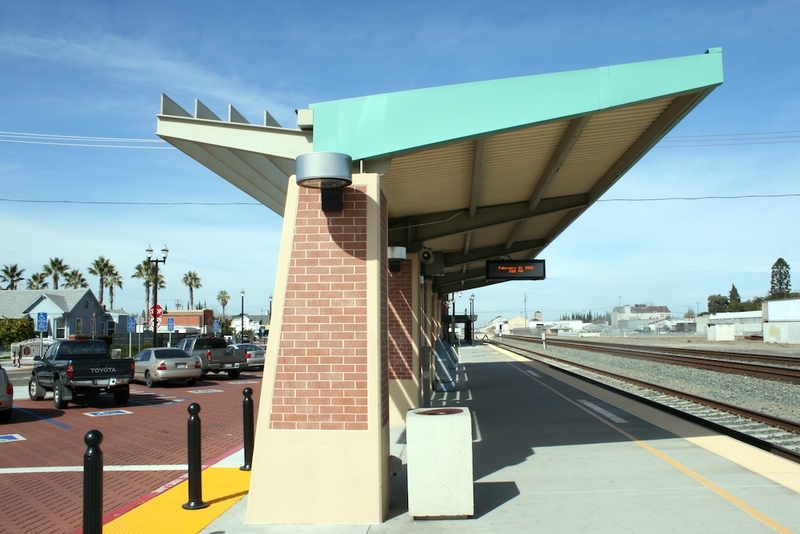 An access road runs straight back from the depot to Aurora Street where an entry arch with Robert J. Cabral Station written in it welcomes passengers. Between this access road and Miner Avenue is one of the stations 3 small parking lots, it has a brick, not asphalt surface. 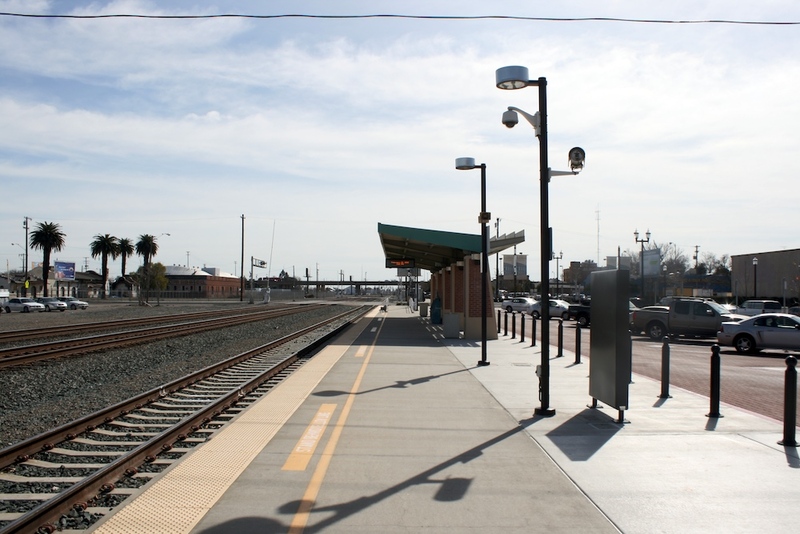 Continuing south of the depot, the platform continues all the way south to the grade crossing with Weber Avenue. 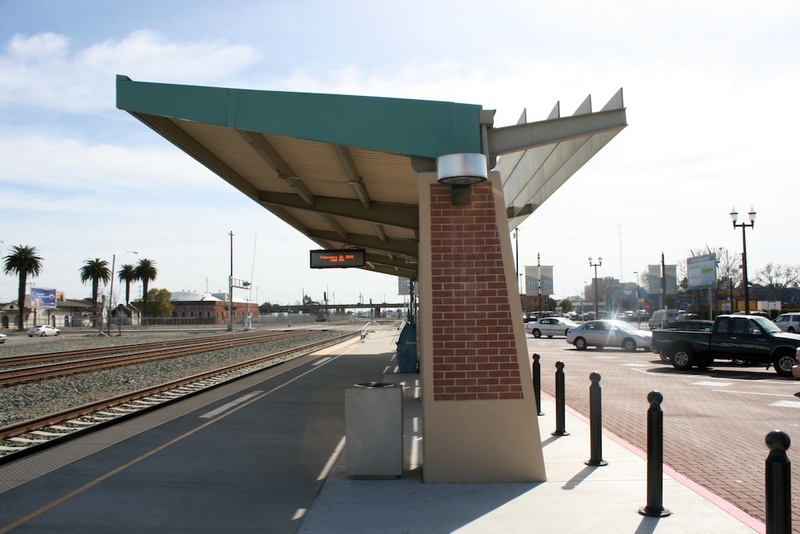 Over the southern portion of the platform is a single relatively long canopy structure over a decent portion of the platform with brick posts holding up the green canopy. 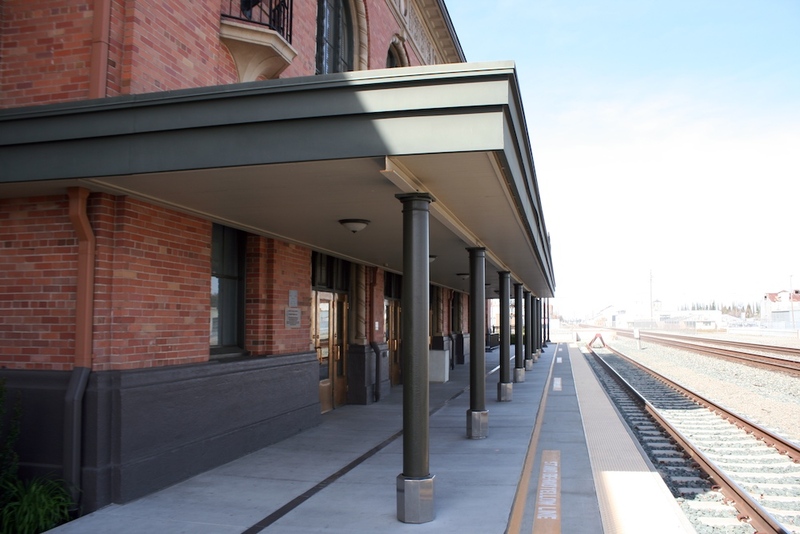 Beneath this canopy is the stations one Amtrak Quik-Trak machine. 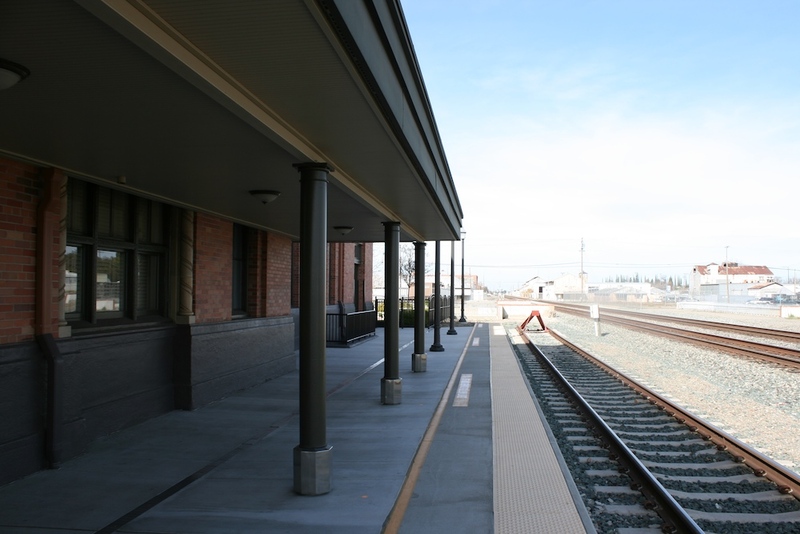 At the southern end of the ACE platform beyond the canopy is the required slightly higher ramp platform for wheelchair ACE boarding. 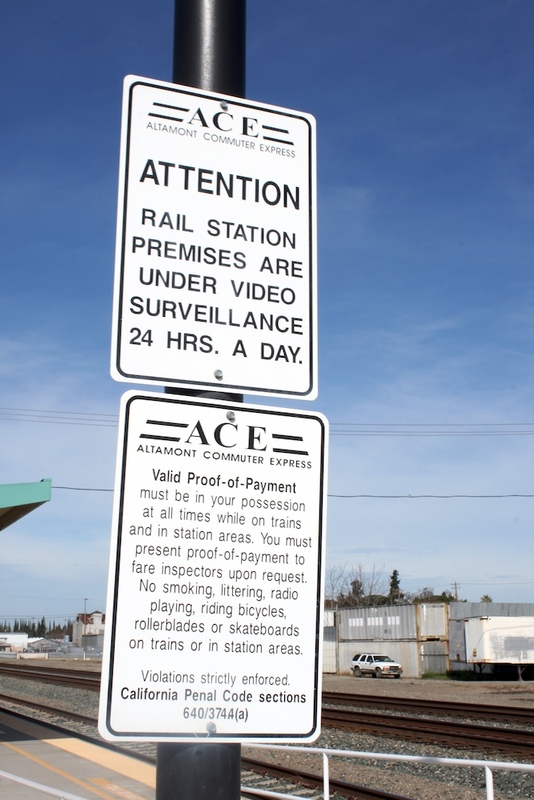 This platform has a small brick parking lot with just 30 minute visitor and wheelchair parking spaces, purple ACE signs are beneath. Just south of the grade crossing with Weber Avenue is the only place where any evidence of Amtrak (minus the Quik-Trak machine) exists since it stops in the middle of the street. 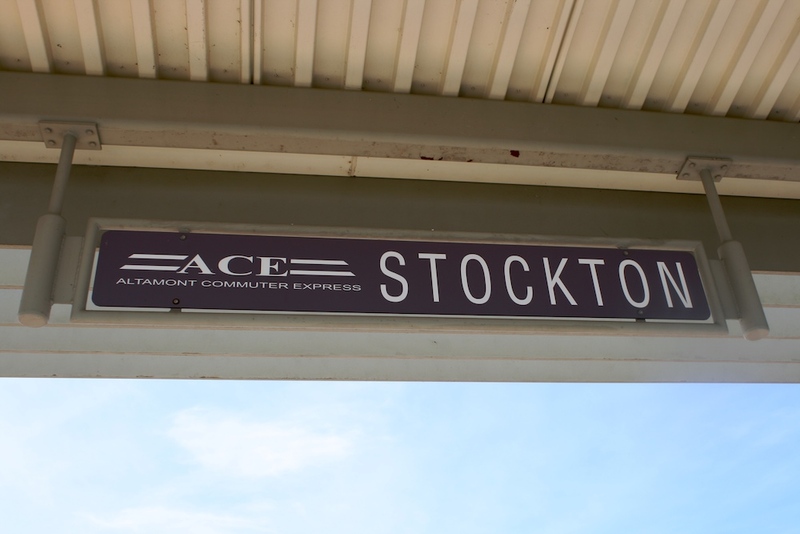 At the SE and SW corners of the grade crossing on either side of the tracks just along ballast is a modern Stockton/Downtown, CA Amtrak sign. There is also a newly installed wheelchair lift enclosure near the SW corner. 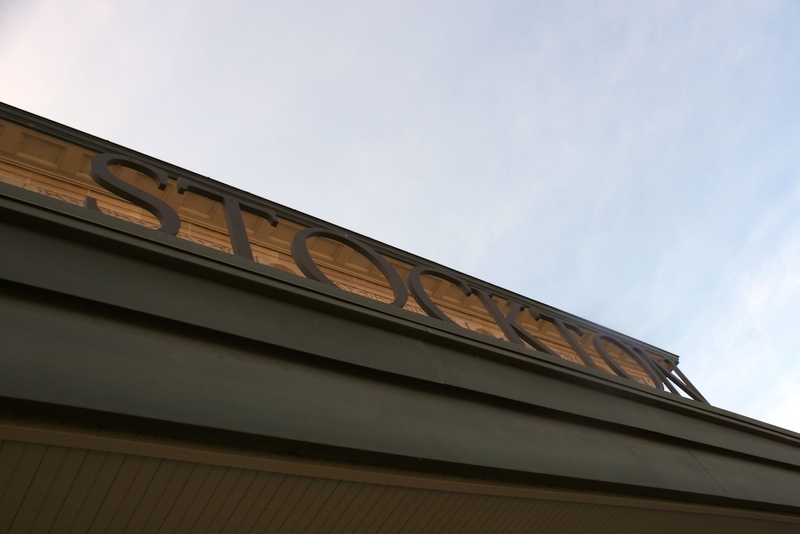 This is in the corner of another small ACE parking lot that stretches south a block to the next grade crossing at Main Street. Across from this set back from the east side of the tracks (along Union Street) is the derelict historic Western Pacific Depot fenced off. 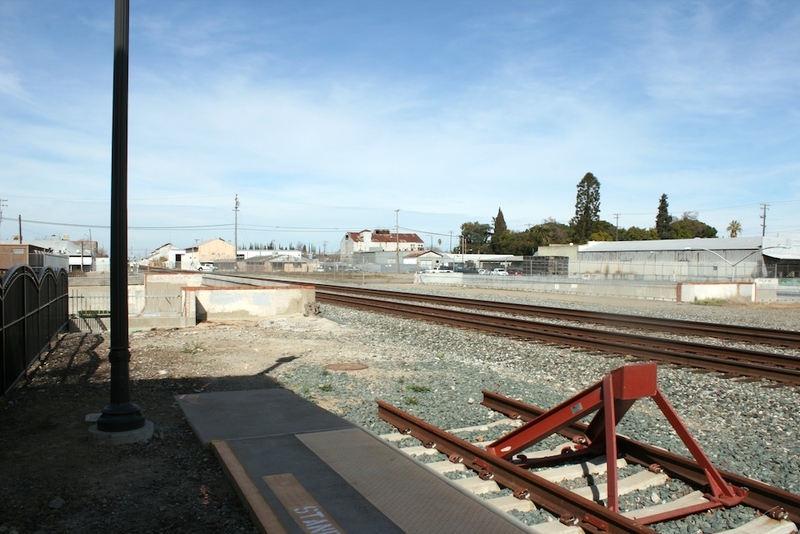 There is a final slightly smaller ACE parking lot that runs down the next block along the tracks from Main to Market Street.